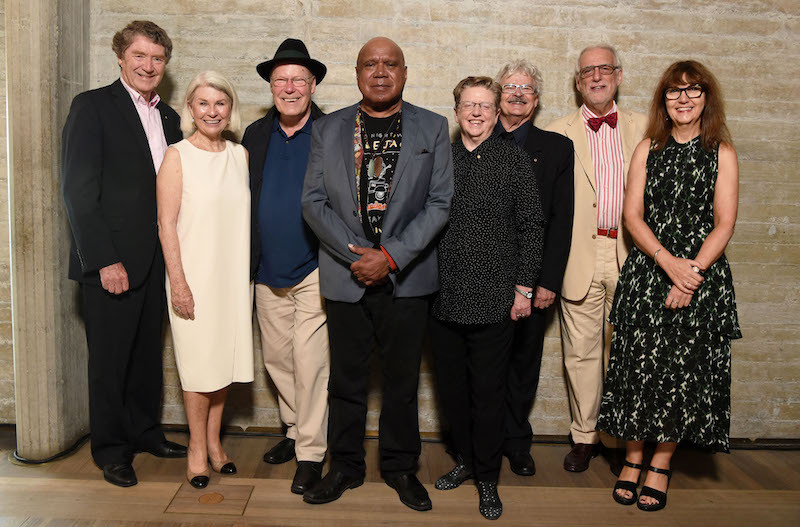 To mark its 100 years of service, Live Performance Australia (LPA) has honoured ten Australian arts leaders with 2017 Centenary Awards, among them Jim Sharman, Reg Livermore, Robyn Nevin and Rhoda Roberts. These special lifetime achievement awards were presented this morning at the Sydney Opera House. Founded in 1917 as the Theatrical Proprietors’ and Managers’ Association, LPA is the peak industry body representing Australia’s live performance entertainment industry. It presents the national Helpmann Awards, which recognise the best in live performance across genres and across the country. Each year as part of the Helpmanns, LPA presents the JC Williamson Award, which recognises individuals who have made contribution to the Australian live entertainment and performing arts industry, and the Sue Nattrass Award, which recognises service in a field that may not have such a high profile, including administrators and technicians. The Centenary Awards comprise five 2017 Centenary JC Williams Awards and five 2017 Centenary Sue Nattrass Awards. The Centenary JC Williamson Awards went to Robyn Archer, Reg Livermore, Robyn Nevin, Archie Roach and Jim Sharman. The Centenary Sue Nattrass Awards went to Carrillo Gantner, Ian McRae, Rhoda Roberts, Susan Provan and Frank Van Straten. Robyn Archer is a singer, writer, director, festival artistic director and arts advocate. She is a world-renowned performer of classic European cabaret and her one-woman show A Star is Torn is legendary. Reg Livermore is one of our leading musical theatre performers. Following his ground-breaking solo shows in the 1970s, including The Betty Blokk Buster Follies and Wonder Woman, his numerous stage credits include Frank ‘N’ Furter in the original Australian production of The Rocky Horror Show, Max Bialystock in The Producers and, most recently, Alfred P. Doolittle in My Fair Lady. He published his autobiography Chapters and Chances in 2004. Actor, director and artistic director Robyn Nevin was among the first intake of acting students at NIDA. She has acted for all of Australia’s state theatre companies and has been Artistic Director of Queensland Theatre Company and Sydney Theatre Company. Recently, she played Mrs Higgins in My Fair Lady. Singer/songwriter Archie Roach is a proud Gunditjmara/Bundjalung man.His song Took the Childre Away on his 1990 debut album Charcoal Lane shone a light on the impact of the forcible removal of Aboriginal and Torres Strait Islander people from their families. He has released a further eight albums and won many awards including a 2005 Helpmann Award with his partner Ruby Hunter with whom he frequently performed until her death in 2010. Jim Sharman is a stage and screen director whose many credits include landmark productions of the musicals Hair, Jesus Christ Superstar and The Rocky Horror Show in Australia and overseas. He was Artistic Director of the ground-breaking 1982 Adelaide Festival of Arts and of Lighthouse for the State Theatre Company of South Australia. He has also directed productions for Opera Australia including the premiere of Richard Meale’s Voss, based on Patrick White’s novel, Death in Venice and Così fan tutte among others. His memoir Blood and Tinsel was published in 2008. Carrillo Gantner was the founding Artistic Director of Melbourne’s Playbox Theatre Company, now Malthouse Theatre. He is Chairman of The Sidney Myer Fund and was Chairman of Asialink from 1992 to 2006. His many other roles have included President of the Victorian Arts Centre Trust and The Melbourne Festival. He was the primary initiator of the new Asian Triennial of Performing Arts (Asia TOPA), which took place in Melbourne earlier this year. Ian McRae was General Manager of The Australian Ballet from 1991 to 2002, joining the company in 1986 after five years as Administration Manager of the Victorian Arts Centre. He has been a Chair of the Australia Council Theatre Board and has also been a board member of Victorian College of the Arts, Malthouse Theatre, Bangarra Dance Theatre, Bell Shakespeare and Melbourne Recital Centre. He is currently Chair of the Australian National Academy of Music (ANAM). Susan Provan is the longer-serving Director of the annual Melbourne International Comedy Festival, which she has been running since 1995. Her previous roles include Associate Producer of the State Theatre Company of South Australia and General Manager of Circus Oz. Rhoda Roberts is a journalist, broadcaster, actor, producer, writer, arts advisor and artistic director. A proud member of Bundjalung Nationa, Wiyebal Clan of northern NSW, she is currently Head of First Nations Programming for the Sydney Opera House. She co-founded Australia’s first national Aboriginal theatre company, the Aboriginal Natioin Theatre Trust (ANTT) and was Creative Director for the Awakening segment at the Sydney Olympic Games Opening Ceremony. Frank Van Straten is a writer and researcher specialising in Australian performing arts history. He was the founding curator of Arts Centre Melbourne’s Performing Arts Museum and later became its Director. He presented the ABC radio show Nostalgia Show for 15 years and has published six books on Australian theatre history. The awards were presented by Andrew Kay, President of LPA, Sue Nattrass, a past JC Williamson Award recipient and Michael Lynch, a past recipient of the Sue Nattrass Award. The industry peak body has made recommendations designed to drive innovation and job creation.